PLA Member R&B Global Projects unloaded a heat exchanger weighing 96 tons from the vessel directly onto a truck in Rijeka port, Croatia. Transport from Rijeka port with over-weight heavy road transport to Kostrena, Croatia. The heat exchanger also included a spray bar + service parts which they transported with normal trucks from Italy to Kostrena. During last week, the forwarding department of Steder Group HQ, Rhoon, The Netherlands, successfully collected, loaded, lashed, and shipped out a transformer and auxiliary parts from Finland. Upon arrival at the UAE, their colleagues arranged a smooth receipt and door-delivery to the customer. Express Global Logistics (EXG) PLA memberfor India handles RO-RO cargo at Chennai Port. The unloading and customs clearance of the Marine Unloading Arms was executed by the Chennai team of Express Global Logistics (EXG). The shipment contained a total of 14 packages, in which there were 4 ODC with dimensions of 18.3 x 3.60 x 3.35 meters each. The total volume of the cargo was 1202FRT. The shipment was seamlessly handled by the EXG Team and the cargo was cleared at Chennai port in record time and safely. 10 Mafi were used for unloading the shipment, 4 x 60 feet and 6 x 40 feet. Customs clearance completed within 24 hours of vessel berthing at port. Out of charge was obtained within 30 hours of vessel berthing. With speedy documentation, planning and defined process, the entire cargo was made available for delivery within 30 hours of vessel berthing. Express Global Logistics Pvt Ltd, (EXG) India is a project specialist company established in 1946 with headquarters in Mumbai, India. It is an asset based company, having pan India presence backed by its own fleet of Goldhofer hydraulic axles, cranes up to 450 tons, and warehouses. 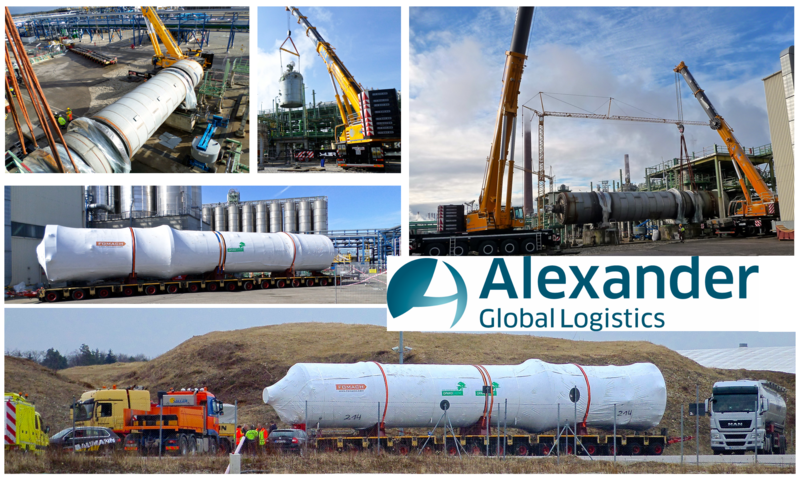 Last weekend FLS Projects PLA member for Thailand completed the loading operation for the first out of four shipments for the ALBA Power Station 5 Project in Bahrain. Over the next 3 months, FLS Projects will be moving more than 21,000 cbm of HRSG casings, staircases, platforms, stack sections and other steel structures. FLS’ scope includes the transportation from the fabricator’s workshops in Bangkok area and the Eastern Seaboard to Laem Chabang, customs clearance, storage, port handling up to FAS, supervision and marine survey. Steder Group Djibouti recently moved two ball valves for Genale Dawe Hydro Power Project from the port of Djibouti to the project site in Ethiopia. Delivery was done inside the dam through tunnels, which was a challenge but thanks to meticulous planning and Steder Group boots on the ground, this hurdle was taken without incidents. Each ball valve had a weight of 130 metric tons. Distance travelled was approx. 1450 km, items were safely delivered as scheduled. C.H. 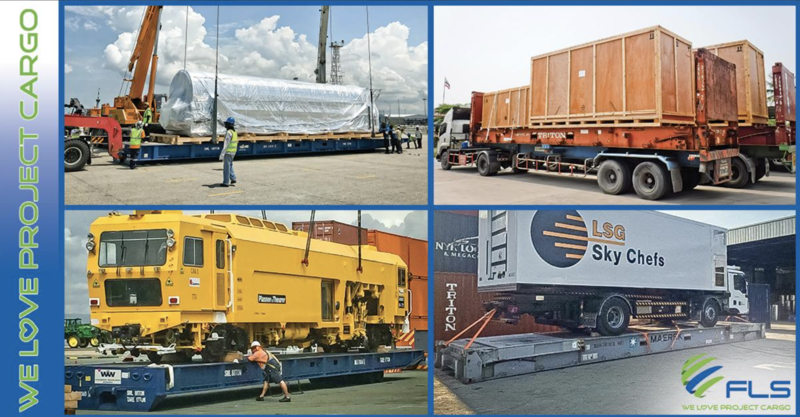 Robinson Project Logistics, PLA member for the USA, Canada, and Singapore recently transported 53 packages of Capital Equipment from China to Korea for a customer in the Chemical Processing industry. Operations went smoothly, other than a brief stoppage due to heavy fog. The equipment was well stowed at the center of the lower hold and tween deck. Project specialists were onsite to supervise the Operation at all points of handling. The cargo was later mobilized by specialized transporters to the receiver’s yard. PLA Members FLS Projects reports about the final completion of a 20 month Project. THANK YOU VERY MUCH to our customers, our sub-contractors, everybody involved and especially the TEAM for an exceptional job well done! Thank you very very much – It has been an exciting time! And most importantly, the NUMBER OF CLAIMS: ZERO! FLS Projects PLA member for Thailand, Singapore, and USA is handling more than 15,000 TEU of containerized, project related cargo annually, break bulk on container vessels, Flat Racks & RoRo. Pipes, steel structures, vehicles and heavy machinery, no matter the type of cargo, origin or destination, FLS Projects will arrange for stuffing & lashing plans, provide stuffing & lashing services, marine survey, insurance, inland haulage, customs clearance, purchase or lease of SOC, and of course the ocean freight booking at competitive rates. Over the past 20+ years, FLS has become a specialist in this segment and has signed volume contracts for project related cargo with all major carriers. Logimar Srl, PLA member for Italy, completed haulages and operations in Genoa Port to ship a batch off cooling line to India. 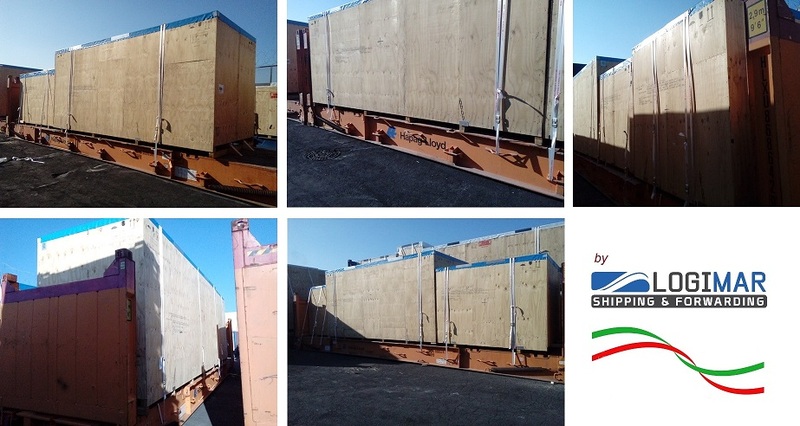 The machine tool was packed in 18 wooden cases and delivered from North of Italy area to the port of Genoa, than cargo has been stuffed and lashed on 8x40' FR OOG and shipped to Chennai India by container vessel. CMX PLA Member for Australia, United Arab Emirates, and USA reports about the following transport: 9x CATERPILLAR MT4400’s ex Bunbury, Western Australia to Mackay, Queensland. Details: 8,660.355 CBM/ 2,160MT of cargo, single crane lifts, part chartered vessel. Commodity: 200t mining trucks. Challenges: The trucks needed to be disassembled in order to be transported from origin site to POL, then rebuilt in the port for shipping. 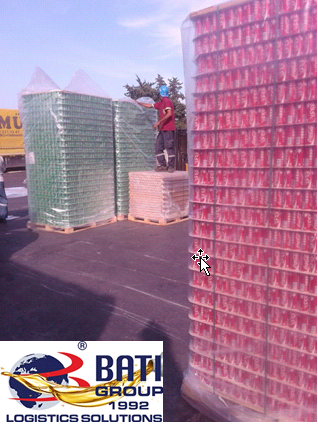 BATI GROUP PLA member for Turkey has succesfully transported empty Coca Cola cans to Iraq from the port of Mersin. We are recieving the containers in the port of Mersin and stuffing them on the port. Once we have a truck load of cans, the packaging is done with bubblle wrap and the cans are loaded to the trucks. Once again BATI GROUP succesfully takes care of a Project from MERSIN – IRAQ. 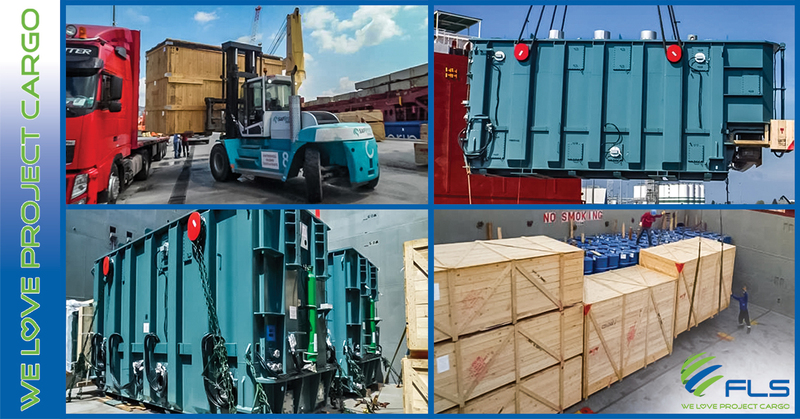 FLS Projects PLA member for Singapore, USA and Thailand completed an urgent shipment of 2 transformers each weighing 158 tons and related accessories from Turkey to Taiwan for TPC’s Dah Tarn project. The vessel was chartered by FLS on a last in / first out basis to meet the client’s extremely tight delivery schedule. FLS in fact positioned the vessel before the cargo was at the port to ensure it could sail the moment the transformers were ready to ensure the shortest possible transit time. Another job well done by FLS Taiwan! Structural Steel for New Zealand! 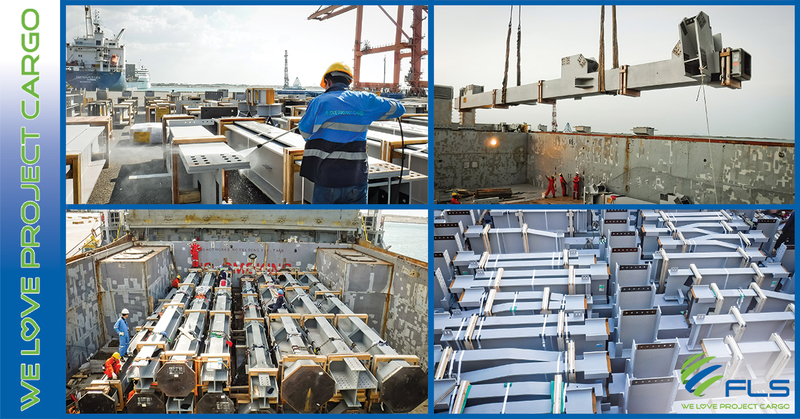 In Dec. 2016 FLS Projects - PLA member for Sinapore, Thailand and USA - started shipping structural steel for the Commercial Bay Tower and the New Zealand International Convention Center. Tonight, the third out of seven vessels will arrive in Marsden Point Port, NZL. 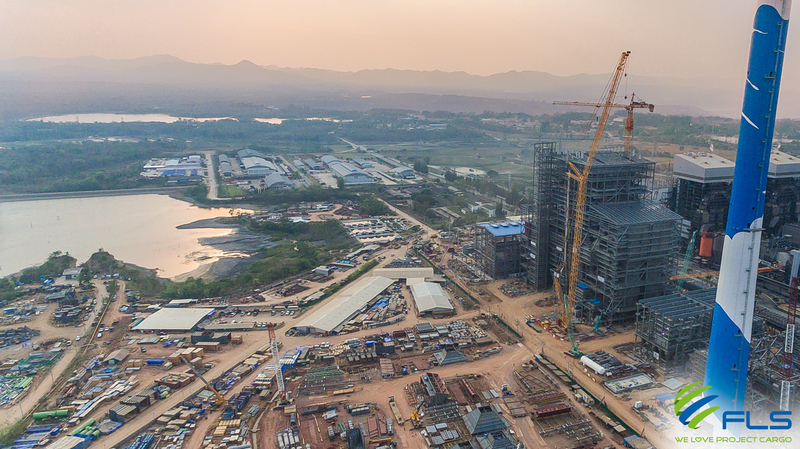 So far FLS has shipped about 7,000 RT of Breakbulk from Laem Chabang, Thailand for these two projects, with another 12,000 RT to go. Besides that, another 250 x 40’ containers will be shipped by regular liner services. FLS’ scope includes the delivery from factory to the port, customs clearance, port handling, cleaning the cargo to meet NZL quarantine requirements and of course the chartering of suitable multipurpose vessels. First Global Logistics Egypt PLA member for Egypt was awarded by one of the biggest Pulp & Paper companies in the Middle east for shipping their new Production Line Machinery from Riyadh, KSA up to Alexandria, Egypt for their new Plant in Egypt. This nomination came after presenting a technical solution based on machinery dismantling to fit in containers instead of break bulk which saved the client significant freight costs. The scope of this project consisted of shipping three Production line machinery from the supplier’s door in Riyadh to final place of delivery in Alexandria Egypt. First Global Logistics successfully shipped the 1st shipment (Production line 1) and their job has started mid of April covering all the following services: •	Cargo survey for the Shipping solution decision •	Machinery dismantling in accordance with technical surveyors reports to fit the container stuffing •	Cranes / Forklifts / Labors mob-demob at the supplier's site •	Loading / stuffing / lashing & securing •	Trucking Empties & full containers from Jeddah port to Supplier address & trip full back •	All road permits & approvals for OOG •	All customs clearance & documentation formalities at origin /destination •	On carriage from Alexandria port to client's Plant The 1st Job was accomplished by shipping 18 containers (10*40'Hc + 5*40'OT OOG + 3*40'Flat rack OOG) - Total Weight: 330.00 tons – Total CBM: 1081.00 M3. There are still 2 Jobs remaining similar to the above work, expected to be 15 containers each including special equipment usage so the whole project to achieve 38 containers covering a 100% Door to Door project service. About 1 year ago Alexander Global Bremen (AGL) PLA member for Germany, Russia, and Mongolia has been awarded the HDPE the Plant project. The project includes the complete logistics for the movement of a second hand HDPE Plant from Burghausen, Germany to CFR Bandar Abbas Iran. The total volume consisted of about 400 x SOC Container and approximately. 7000 FRT break bulk cargo. The main OOG Units got following details: 2500 x 500 x 500 / 130 tons 850 x 550 x 600 / 45 tons 850 x 550 x 600 / 45 tons 620 x 300 x 200 / 54 tons 700 x 340 x 350 / 42 tons The project is right now in the “hot” phase as the OOG units just moved during the last 2 months. The biggest units have been moved by combined road/barge via the port Passau onward to Antwerp and finally to Bandar Abbas, Iran. We expect that the entire project will be finished end by end of June 2017. AGL is responsible for the complete logistics part as from on-site in Burghausen to Bandar Abbas. As the plant is a second-hand one the special task is to have a strict follow up on all details like dims / weights in order to make sure that permits and transport arrangements will work perfectly. For this reason, AGL has sent own logistics coordinator on site for 6 months who takes care of all local arrangements and was in deep contact with all involved companies like dismantling company, the site owner, the crane company, trucking companies, and of course AGL’s customer. This is another example of AGL’s capabilities in the second-hand movement of complete plants. 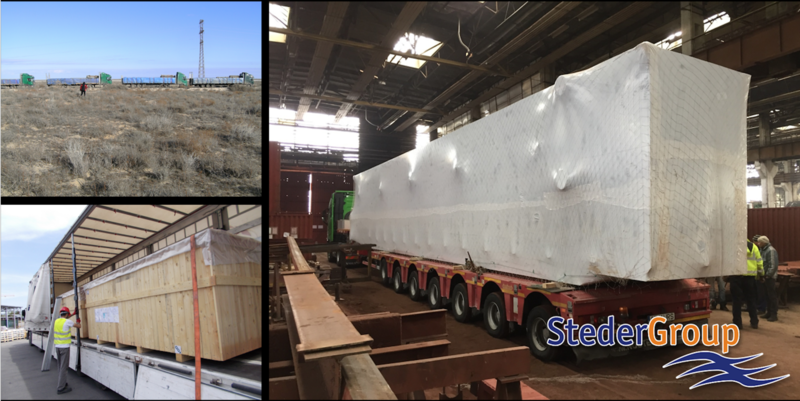 Steder Group Logistics PLA member for Belgium, The Netherlands, UK and Romania with their Head Quarters in Constanta, is proud to announce that they performed another successful transport from Romania to Turkmenistan serving one of their major clients active in the offshore industry. In this case a total of 10 trucks were used to transport the cargo. Steder Group Logistics is specialized in serving its clients which are active in the Caspian Sea region and are mainly active in the Offshore, Dredging and Oil & Gas industry. From Romania, Steder Group Logistics is using Constanta port as a hub / transshipment port linking North-Western Europe with Russia, Kazachstan, Turkmenistan and Azerbaijan through the Caspian Sea. 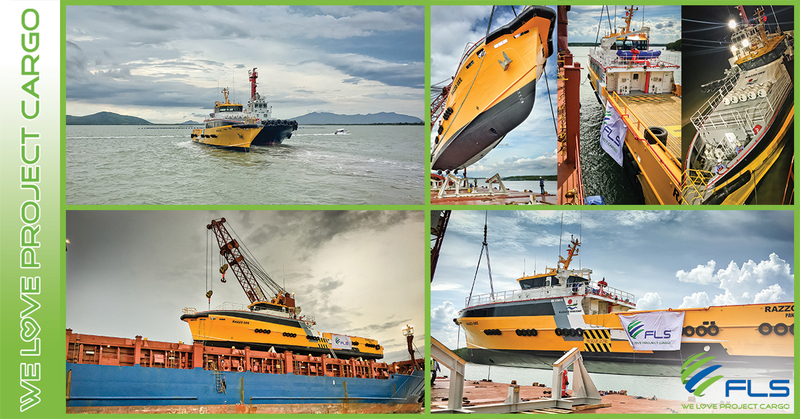 “Last weekend FLS Projects Vietnam completed the loading operations of yet another 122 MT – 40 x 8m crew boat from Vung Tau, Vietnam to Egypt. FLS Projects and our specialized stevedores ensured that the cargo was handled with the highest care to match FLS standards. FLS’ scope included the vessel chartering, pre-inspection of the boat, customs clearance, pre-carriage with a 4,000 HP Azimuth tug, loading operation, arrangement of additional fenders to create more space between crew boat and the heavy lift vessel, as well as the positioning and adjustments to the cradles. FLS Projects PLA member for USA recently completed the discharging operations in New Orleans for a shipment of Air Filter Equipment with a volume of 2,200 cbm. The consignment included several large break bulk items and SOC containers. After customs clearance the cargo was then delivered from New Orleans port to a jobsite approx. 100 miles away. 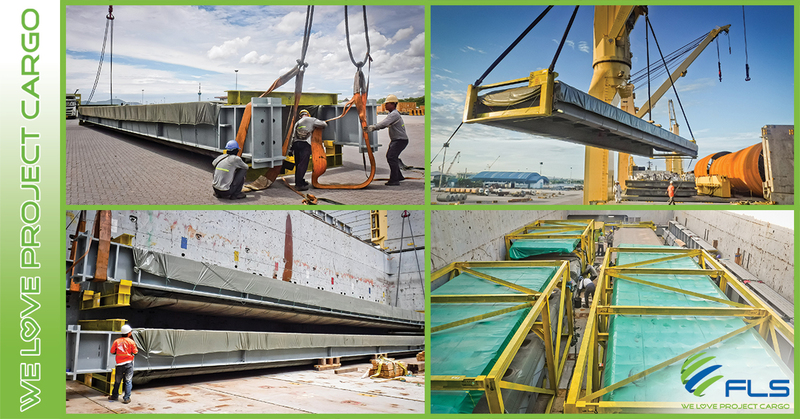 FLS scope of work covered the discharge supervision, port handling, storage and on-carriage, as well as the provision of permits and escorts for the oversized cargo. Congratulations and well done Team FLS USA!